Stony Creek Open House- Was a great success there was huge voter turn out for the new trail. Thank you to all the members that showed up. Steve and Pete are putting together a plan together for the trail. This trail will be part of a 5 year master plane with the park. The new winter groomed trails page is up on the web site. Thank You Nick for putting together. Melissa Werkman is has been hired as the IMBA ARD for Michigan. Membership- We are at 339 that is 73% increase. Means we now split 50/50 with IMBA. Treasure- Kristen has report. With donation of $100 from Macomb bike and $50 from sales force. $350 from Back to the Beach half marathon for bike patrol training. Nick to handle CRAMBA jersey. Cost will be somewhere around $75 design is being finalized. Board is looking into key chains and water bottles. Addison- Is doing a control burn in the next couple days. Stony- Trail Day 23rd will work on rock garden, boardwalk. Joe is donating wood for Boardwalk. Bald Mtn- Trail day soon. River bends- Jeremy and Steve have been in talks with Shelby tsp. They have agreed to pay for the signage for the trail. There also was a recent trail day where a 10th of a mile new trail was cut. There is about another 150 yards of new trail still to be cut in. This will make the blue loop one way trail. We are going to try and hold a trail building 101 & 102 classes with Nick and some other TC’s at River Bends. Clinton River Park Trails (Sterling Heights)- is under water from all the rain. Bloomer- Eric had a meeting with Alan. They discussed some different project. Eric will write proposals and present for approval. Also thinking about starting a Thursday night group ride. Along with maybe by weekly trail days on Mondays. Josh from Holly High School spoke about his plan to build a trail behind the high school. And what he has already done and what his plans are to finish. And if CRAMBA would like to help. Orion oaks manger also spoke about the trail system they are trying to promote. Bike Patrol- New member orientation on April 30th. Will have 6 new members when done with orientation. Should increase number of patrollers to 48! 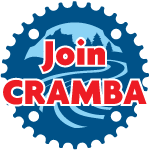 Group rides– River Bends on Tuesday. Stony Creek on Wednesday see web site or Facebook for details. Island Lake Spring Bike Demo Day May 7th.